Helton asks the difference between kigamae and zanshin. This question deserves more than a two word answer. Kigamae in everyday Japanese means mental position or approach. According to the AJKF Japanese English Dictionary of Kendo the meaning of kigamae is “the state where one’s entire body is alert and ready to react to the moves of the opponent’s mind and body that precedes a strike”. In effect it is your “mind posture” a state of awareness where you are completely tuned into your opponent. The focus of kigamae is anticipation of your opponent’s movement in readiness to strike. 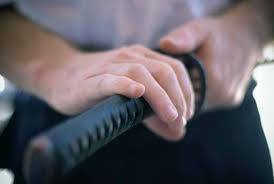 The most basic kendo explanation of the meaning of zanshin is “a state of awareness after striking”. The concept of zanshin is however far more complex. In Zen zanshin means complete follow through, leaving no trace. Zanshin means “the remaining mind” and also “the mind with no remainder.” This dichotomy is also echoed by explanations I have heard about nokori, the remaining breath after a strike and kiai. For both breath and awareness the suggestion is that they remain and yet not remain. Breathe in –hold your breath –make kakegoe, expelling a proportion of your held breath -step in while styill holding your breath – keep holding your breath in tame- launch yourself from the back foot and strike men in the timing of one, expelling the remainder of your breath – move through to a safe distance – turn and face your opponent in chudan no kamae while holding your breath, keeping yourself in a state of readiness to attack again. In practical terms zanshin is the continued awareness of your opponent after you strike. You should be in a position to attack again instantly if he or she makes a move against you. I would imagine that this is even more obvious to Iai practitioners where zanshin is a matter of watching intently after delivering the final death blow. This is where I expose my ignorance, but I have the impression that even in returning the sword to the saya, it is done with the feeling of being able to draw again quickly should circumstances require it. So to sum up – kigamae is the state of being ready to do it before you do it. Zanshin is the readiness to do it again after you have done it. Actually, i first asked because i was translating the previous article and couldn’t find kigame meaning anywhere. Then after the answer i got confused since both are very similar but now make sense. It’s funny how japanese language have so many concepts for mental states especially in martial arts. The sum up is great and shows in my eyes the main difference in these concepts of readieness: kigame is prior expierence and zanshin post.